A remaining time counter is very useful when you are designing a coming soon page. It displays the time remaining to a project launch or to a website opening. So, today’s free web design resource is a dark countdown timer. 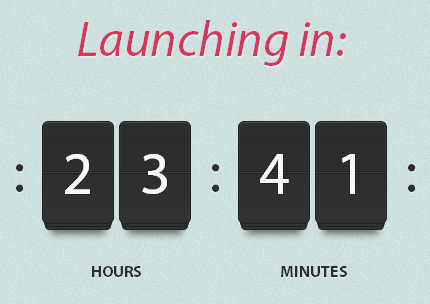 I designed this timer using CSS3 and the jQuery countdown plugin from Martin Angelov of tutorialzine.com. I think CSS3 offers a lot of graphic effects that, when combined with jQuery, can add a lot of functionality to a web page. You can view a demo of this counter from the link below. It displays the days, hours, minutes and seconds remaining and it’s set to 20 days from now, but you can customize it as you like. You can use this time counter in personal and commercial projects, but you can’t sell or redistribute it directly. If you want to publish it somewhere, please refer to this page. do u know how can i set this countdown to a specific date. and each time i reset my page it keeps going to 20 hours again! how do i change that. This is for 25 March 2013.